NAJRAN – A Jordanian F-16 warplane crashed in Saudi Arabia on Friday but its pilot survived, the Saudi-led military coalition fighting Shiite Huthi rebels in neighbouring Yemen said. “Technical reasons” caused the crash of the US-built aircraft in the Najran district on the Saudi side of the border with Yemen, the coalition said.It added that the pilot was in good condition. Separately, the United Arab Emirates army command announced the death of one of its soldiers fighting in Yemen as part of the coalition.He was the second Emirati soldier in a week to die in Yemen, raising to around 80 the number of troops from the UAE killed in coalition operations against the Huthis and their allies. The coalition launched air strikes, training and other military assistance nearly two years ago to support Yemen’s President Abedrabbo Mansour Hadi. The rebels are allied with former members of the security forces loyal to ex-president Ali Abdullah Saleh. In March last year, two Emirati pilots were killed when their Mirage warplane crashed in Yemen because of what the coalition called a “technical fault”.Three months earlier, a Bahraini pilot survived when his F-16 crashed in Saudi Arabia, reportedly also for technical reasons.A Moroccan air force pilot died in May 2015 when his F-16 went down in Yemen, with the coalition blaming human error or a technical fault.Two Saudi F-15 pilots were rescued when they ejected from their jet off Yemen’s coast shortly after coalition air strikes began.Rights groups have repeatedly criticised the coalition bombing campaign over high civilian casualties. At least 15 Iraqi border guards, including two officers, were killed Friday morning in an attack by ISIS in Iraq’s western Anbar province, according to a military source. ISIS gunmen and suicide bombers targeted a border guards headquarters near Anbar’s Trebil border crossing with Jordan, Army Colonel Walid al-Deleimi told Anadolu Agency. Al-Deleimi said that reinforcements, including army troops and border guards, had since been dispatched to the area to help repel the attack. CAIRO – Hundreds of thousands of Yemeni children languishing in refugee camps and remote villages are nearing starvation. Families who fled airstrikes are being forced to return to war-shattered homes, risking their lives again. The United Nations and other humanitarian groups are describing alarming scenes in the Middle East’s poorest country as a humanitarian crisis and conflict deepen after nearly two years of war. In recent weeks, clashes between rebels known as Houthis and forces loyal to the U.S.-backed government have intensified, especially along the western coast of the country. Airstrikes near a major port in the city of Hodeida – the main entry point for food, medicine and humanitarian aid into northern Yemen – have slowed the delivery of supplies and exacerbated the misery. Almost a half million children are severely acutely malnourished, a nearly 200 percent increase since 2014, the United Nations Children’s Fund said this week. The United Nations described Yemen, along with Somalia and northern Nigeria, as “on the brink of famine,” and declared that famine has already gripped parts of South Sudan. In Yemen, more than 7.3 million are in need of urgent food assistance. The substance used in the killing of Kim Jong-nam was a “VX nerve agent”, a highly toxic liquid used only in chemical warfare, Malaysian police have said. The findings follow a preliminary analysis of swabs taken from the face and eyes of the victim, who is the half-brother of the North Korean leader, Kim Jong-un. More items linked to the attack at Kuala Lumpur airport were still being analysed and the terminal would be decontaminated, police said. VX – also known as ethyl N-2-Diisopropylaminoethyl Methylphosphonothiolate – is classified by the United Nations as a weapon of mass destruction. The Trump administration is headed towards a diplomatic confrontation with Moscow at the United Nations, as the United States, Britain and France pressed for the passage of a resolution sanctioning Syria’s use of chemical weapons in the face of a certain Russian veto. The Dutch anti-Islam politician Geert Wilders and his populist Freedom party have suspended all public campaigning for next month’s parliamentary elections following an alleged security leak. Dutch media reported this week that a member of the far-right politician’s police security team had been arrested on suspicion of leaking details of his whereabouts to a Dutch-Moroccan criminal gang. The Algemeen Dagblad newspaper reported on Thursday that the officer and his brother, both previously members of the Utrecht police force, had also been investigated in the past in connection with suspected leaks of confidential information. A suicide bomber attacked Turkish-backed rebels just outside the Syrian town of Al-Bab Friday, killing 42 people in a major blow just hours after they hailed its capture from ISIS. The bomber blew up a vehicle packed with explosives outside a rebel command centre in the village of Susian, five miles northeast of Al-Bab, the Syrian Observatory for Human Rights said. The blast devastated the twin command posts and also seriously wounded a large number of fighters, the Britain-based monitoring group said. Germany’s foreign intelligence service BND long spied on journalists of the BBC, The New York Times, Reuters and other media, news weekly Der Spiegel reported Friday. The magazine, which has extensively worked with US fugitive intelligence contractor Edward Snowden and reported on US and German espionage scandals, only cited documents it had seen. While it is unknown exactly who the BND spied on, news of the surveillance is a culmination of the three year inquiry that resulted in German Chancellor Angela Merkel giving evidence last week. Two-thirds of the German firms polled predicted mounting revenues, exports and investments in Russia, with the poll taking into account the views of companies with a total of 122,000 employers and combined annual revenue of 29 billion euros ($30.7 billion) in Russia. The US-led coalition against the Islamic State (Isil) is for the first time killing more civilians with its airstrikes than Russia is with its own bombing campaign, according to a new analysis. Coalition warplanes have dramatically stepped up their strikes against Isil in both Mosul and Raqqa, while Russia has scaled back its campaign in Syria after a patchy ceasefire went into effect in December. While Russia has killed far more civilians in total than the coalition, it is currently killing fewer civilians than the allies, research by the Airwars monitoring group found. Airwars estimated that between 254 and 369 civilians were killed by the coalition in Iraq and Syria in January. That is almost twice the number estimated killed in December, when 134 to 187 civilians were found to have died. Negotiations off to rocky start after opposition threatens to skip opening ceremony over disagreements. Geneva, Switzerland – UN-led negotiations on the war in Syria got off to a delayed start following disputes over the participation of the Syrian opposition delegation. Opposition representatives nearly missed the opening ceremony of the talks on Thursday after threatening not to attend over disagreements on the make up and format of the session. But in a last-minute turnaround, they arrived late and as one large delegation. GAZIANTEP, Turkey — The biggest surviving rebel stronghold in northern Syria is falling under the control of al-Qaeda-linked extremists amid a surge of rebel infighting that threatens to vanquish what is left of the moderate rebellion.The ascent of the extremists in the northwestern province of Idlib coincides with a suspension of aid to moderate rebel groups by their international allies. The commanders of five of the groups say they were told earlier this month by representatives of the United States, Saudi Arabia and Turkey that they would receive no further arms or ammunition until they unite to form a coherent front against the jihadists, a goal that has eluded the fractious rebels throughout the six years of fighting. Washington (CNN) The US military is contemplating a long-term presence in Iraq to stabilize the country after the anticipated defeat ISIS, America’s top military officer said Thursday. Chairman of the Joint Chiefs Gen. Joseph Dunford said that both the US and NATO have begun discussions with Iraq about the possibility. “We have, as has NATO, begun a dialogue about a long term commitment to grow the capacity, maintain the capacity of Iraqi Security Forces, but no decisions have been made yet,” Dunford told an audience at the Brookings Institution in Washington, his first time fielding questions since the inauguration of President Donald Trump. London, 23 Feb – The Imam Hossein University in Tehran has confirmed that the Islamic Revolutionary Guard Corps (IRGC) has been deploying students of military leadership to fight in Syria. The university, which is affiliated with the IRGC, said that this was part of an educational drive to train future officers. Iran claims that its presence in Syria is to protect a Shi’ite holy site – the Zeinab Shrine in Damascus. However, since the beginning of the Syrian civil war, Iran has been there as a backbone for the Syrian regime. It has provided Assad with all sorts of support. It is believed that a minimum of 100 students from the university have gone to Syria to train for combat situations. Last year, Ahvaz was ranked the most polluted city in the world by the World Health Organization. It is ironic that Ahvaz residents are facing such difficulties while they are living in one of the most oil-rich cities of the Islamic republic. In addition, although Ahvaz is rich in natural resources, the indigenous Arab residents of Khuzestan are plagued with severe socio-economic deprivation, suffer from one of the highest rates of poverty of the entire population of Iran, and have a high level of water and air pollution. The oil facilities surround and suffocate the city by releasing toxic materials and pollutants in the air. Germany says it has received 136 asylum requests from Turks holding diplomatic passports since the July coup attempt against the Turkish president. The figure is a total for the period August 2016 to January 2017, German media report. Turkey has urged Germany not to grant asylum to any military officers. Some posted to Nato bases in Germany are thought to be among the group. In Greece, two more Turkish soldiers have requested asylum. The pair – reported to be commandos – are believed to have taken part in the failed coup against President Recep Tayyip Erdogan. They are in Greek police custody, having applied for asylum last week in Orestiada, a small border town near Turkey. Bidding to ease public anger over a mounting environmental crisis, Iranian President Hassan Rouhani on Thursday visited an oil-rich southwestern province that has been crippled by sandstorms and power blackouts. Residents of Khuzestan province have long struggled with high levels of dust because of desertification, but the problems worsened this month when severe rains washed the fine particles into power transmission equipment. That caused several days of electricity blackouts last week in Ahvaz, the provincial capital and home to more than 1 million people. Schools and government agencies in much of the province were closed temporarily, and water supplies were disrupted, forcing residents to buy jerrycans of water to drink. Many residents took to the streets of Ahvaz to protest until police issued a warning that anyone participating in “illegal gatherings” would be punished. The Education and Science Labor Union (GEW), which represents educators, said on Thursday that it had received reports from some members that Turkish consulates in Germany’s most populous state instructed Turkish teachers and parents to spy on other teachers and inform on the content of instruction. He is described as codebreaker’s ‘forgotten genius’ and Bletchley Park’s ‘Architect of Ultra Intelligence’ – but despite his contribution to the war effort, Gordon Welchman was persecuted by the British government UK. The brilliant mathematician and University of Cambridge lecturer was selected as a codebreaker before the outbreak of the Second World War. Welchman adapted Alan Turing’s design for the codebreaking Bombe machine, transforming it into a workable device and established Hut 6, leading the team who decrypted more than 1 million German air force and army codes. One of his colleagues at the time described him as ‘one of the most original minds I have ever known’. However, the Government Communications Headquarters described him as ‘a disastrous example to others’ in 1982 after he published details of WW2 codebreaking in his book, The Hut Six Story – and he was subsequently persecuted by US intelligence agencies. China for the first time became Germany’s most important trading partner in 2016, overtaking the United States, which fell back to third place behind France, data showed on Friday. German imports from and exports to China rose to 170 billion euros ($180 billion) last year, Federal Statistics Office figures reviewed by Reuters showed. The development is good news for the German government, which has made it a goal to safeguard global free trade after U.S. President Donald Trump threatened to impose tariffs on imports and his top adviser on trade accused Germany of exploiting a weak euro to boost exports. French far-right-leader Marine Le Pen refused to attend a summons for questioning by police last Wednesday over allegations that she made illegal EU payments to her staff, her lawyer said on Friday. Le Pen, who heads the anti-immigrant and anti-European Union National Front and is a leading candidate in presidential elections in April and May, would comply with any summons after elections this year, the lawyer, Rodolphe Bosselut, told Reuters. Le Pen’s chief of staff was put under formal investigation on Feb 22 after a day of questioning over the alleged misuse of EU funds to pay parliamentary assistants. Her bodyguard was also questioned but was later released without being placed under investigation. Le Pen, 48, who has denied any wrongdoing and says she is the victim of “political dirty tricks”, is set to come first in the first round of an election for president on April 23 but lose in the May 7 runoff to either independent Emmanuel Macron or conservative Francois Fillon, according to opinion polls. 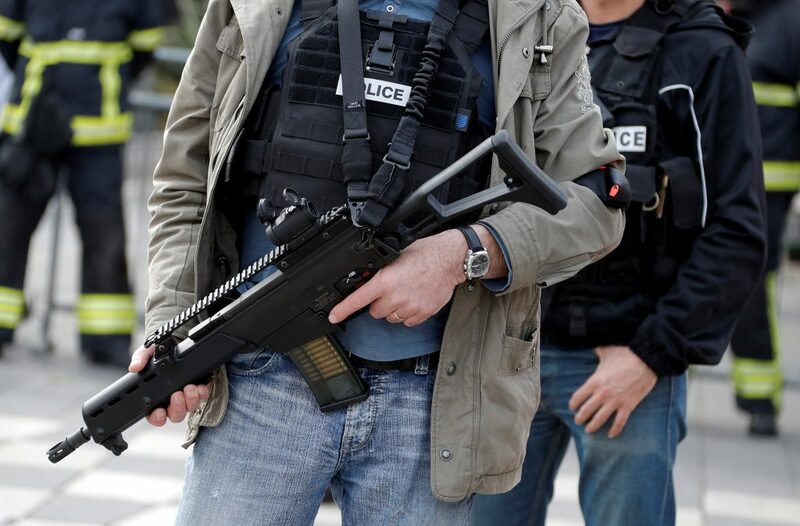 NEW YORK – Two Jewish brothers were beaten, and one’s finger was sawed off, in a horrific anti-Semitic attack near Paris this week, JTA reported, based on a French case report published Thursday by the National Bureau for Vigilance Against Anti-Semitism, or BNVCA. The case report was based on a police complaint filed by the victims, and published on French site JSSNews. Then, a group of Middle Eastern-looking men came out of a hookah café nearby and surrounded their car. The men punched and kicked the brothers, threatening to kill them if they moved. Shockingly, one of the men sawed off one of the brothers’ fingers. French Interior Minister Bruno Le Roux on Friday expressed “indignation” over an attack on two Jewish brothers earlier this week, and said all means will be used to find the perpetrators.According to French paper Le Parisien, the brothers, 29 and 17 years old, were wearing a kippa “visibly” when they were attacked in Bondy, a northeastern suburb of Paris. They were driving in a car when they were drawn into an argument with the travelers of another car — reportedly a father and son — at a red light. One of the occupants of the other vehicle yelled at them “I will kill you, you dirty Jew,” the victims said, according to French media reports. They were forced to a stop outside a bar, where five or six others came to help their assailants, one of the brothers told Israel’s Channel 2 news. The attackers then surrounded the brothers, kicked and punched them repeatedly, and threatened them. Several of the attackers “hit me in the face and the ribs,” the older brother said. “The man holding the saw intended to cut me in the head,” he added. Naval personnel from the US, UK, Oman and France have commenced the 22nd iteration of the annual multilateral mine countermeasures (MCM) exercise Khunjar Haad in the Gulf of Oman. The Khunjar Haad exercise will see the participation of about 150 US sailors and will enable participating nations to share more knowledge and experiences with each other, as well as enhance tactical efficiencies and strengthen their partnerships. Drills will involve evolutions such as gunnery exercises (GUNEXs) to maintain their readiness with on-board weapon systems, and air defence exercises (ADEXs) to help enhance skill in the air and missile defence. Russia’s military has admitted for the first time the scale of its information warfare effort, saying it was significantly expanded post-Cold War. Defence Minister Sergei Shoigu said that Russian “information troops” were involved in “intelligent, effective propaganda”, but he did not reveal details about the team or its targets. The admission follows repeated allegations of cyberattacks against Western nations by the Russian state. Nato is reported to be a top target. Overhaul takes place as Poland asks for help from U.S.
Poland’s conservative government has replaced almost all of its military leadership after hundreds of officers left, an exit that coincides with a call from Warsaw to its NATO allies to help boost its defense. With the government moving to rid institutions of officials appointed by the former ruling Civic Platform party, which it defeated in 2015 elections, 90 percent of the General Staff leadership and more than 80 percent of the army’s top brass have gone, according to the Defense Ministry. They include Chief of Staff General Miroslaw Gocul, who stepped down last month, and Army Commander General Miroslaw Rozanski. The ruling Law & Justice Party has pledged to purge government of what its leader Jaroslaw Kaczynski has called the “worst type of Poles” — people with ties to Civic Platform or the communists who ruled the country last century. It’s also thinning out experienced soldiers who have served in wars alongside their allies in the North Atlantic Treaty Organization, which Poland joined with other former eastern bloc states in 1999. A US warship has plunged towards Russia as NATO forces continue to flood into Eastern Europe. 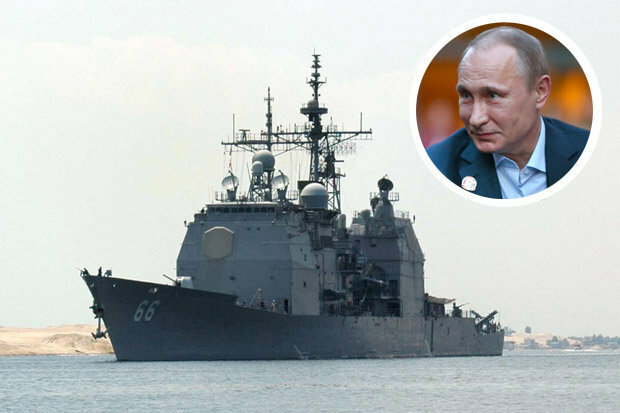 USS Hue City is the latest vessel to move into the Baltic Sea as weapons and soldiers from the western alliance mass close to Russia.Vladimir Putin has fumed over the build-up as the Kremlin condemns the continuous deployments as a “threat” to Russia. The missile cruiser has now entered the Estonian port city of Tallinn, around 150 miles from the coast of Russia. SEOUL: North Korea has up to 5,000 tonnes of chemical weapons, South Korean experts said Friday, including the toxin used to assassinate its leader’s half-brother. Traces of VX — a nerve agent listed as a weapon of mass destruction by the United Nations — were detected on swabs from the face and eyes of Kim Jong-Nam, who was poisoned at a Kuala Lumpur airport last week, Malaysian police said Friday. Malaysian detectives are holding three people — women from Indonesia and Vietnam, and a North Korean man — but want to speak to seven others, four of whom are believed to have fled to Pyongyang. South Korea’s defence ministry said in its 2014 Defence White Paper that the North began producing chemical weapons in the 1980s and estimated that it has about 2,500 to 5,000 tonnes in stock. Feb. 23 (UPI) — The United States military in South Korea has begun to upgrade the Patriot missile system currently deployed on the peninsula. According to U.S. 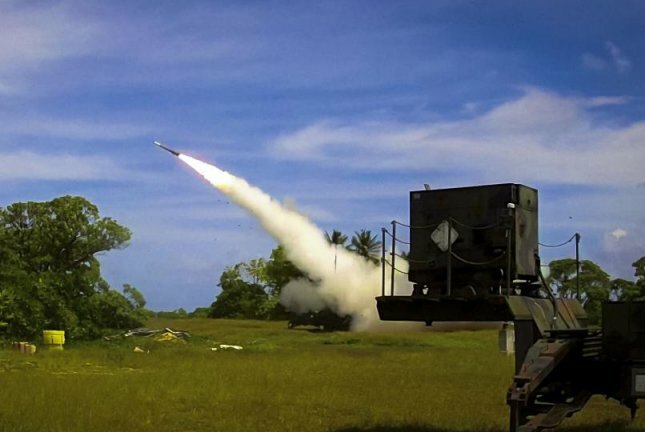 Forces Korea on Thursday, Patriot Advanced Capability-2, a solid-fuel, ground-launched interceptor designed to destroy tactical ballistic and cruise missiles will receive the latest PAC-3 modifications, South Korean newspaper Seoul Shinmun reported. India has signed a $2.5 billion missile deal with Israel wherein both nations will jointly develop a medium range surface-to-air missile system for Indian military. The contract between the Defence Research and Development Organisation (DRDO) and Israel Aircraft Industries (IAI) was approved by India’s Cabinet Committee on Security, headed by Prime Minister Narendra Modi, ahead of his visit to Israel, according to The Hindu. The MR-SAM with a range of 50km-70km is the latest in a series of other variants of surface-to-air missile systems for the Indian Navy and Air Force being jointly built by both countries. On Tuesday the Italian Militare Marina’s FREMM frigate Carabiniere departed Sydney for Melbourne on another leg of her busy Australian PR tour. The Italian FREMM (Frigate European Multi-Mission) has of course been down selected for Australia’s future frigate program and her builder Fincantieri, along with Italian defence primes Leonardo, MBDA, and Telespazio Elettronica have been keen to show her off capabilities. ADM was fortunate to be invited aboard for the leg and was joined by a team from the Navy’s STRATFORCOM and also DST Group. Having exited the heads following an aerial photo shoot within the surrounds of Sydney Harbour, the ship wasted no time bringing its gas turbine online and proceeding at speed towards Melbourne. With 24 knots rung on she proceeded comfortably at 27 knots thanks to the following East Australian Current. The ship has a CODLAG (COmbined Diesel Electric And Gas) propulsion configuration giving her a great deal of flexibility and engine efficiency. Boeing’s Super Hornet is poised for a surprising comeback thanks to President Donald Trump‘s Twitter broadsides and a strike-fighter shortage caused by delays to Lockheed Martin Corp.‘s F-35 program. Now Dan Gillian, who heads the Boeing fighter-jet program, is plotting upgrades to keep the F/A-18 flying through the 2040s – and even looking at increasing the production rate. The U.S. Navy may need at least 100 of the Super Hornets over the next five years while it waits for Lockheed’s next version of the F-35. Boeing also sees opportunities for additional sales from India, Finland and Switzerland.